I’ve talked about my feelings about St. Patrick’s Day in the past, as well as my reasons for celebrating it as Irish Heritage Day instead. I’ve also shared, and will share again, Morgan Daimler’s excellent post on what we do know about St. Patrick, his history, snakes, etc. Each year, I continue to see the same inaccurate histories repeated about Ireland, St. Patrick, Druids, etc. Some people, apparently, even refuse to attend Irish Heritage festivals because of it! My goodness. So, instead of wasting energy gnashing your teeth about bunk history, here are some ways to celebrate Irish Heritage Day that will promote actual Irish history and cultural preservation. Before I begin, I want to remind everyone that I’m an American polytheist and a descendant of Irish immigrants. I will never attempt to represent people who actually live in Ireland, speak Irish, etc. I’m working hard to learn the old ways from Irish sources, so this is important to me, and I gather it’s important to many Irish pagans as well. If you can’t attend a festival, do listen to traditional music. There is plenty to stream online. And if you ever get the chance, buy CDs from bands who are keeping the old music alive and well. Play them for your families and at your gatherings. With time, you and your loved ones will learn to sing along. Perhaps it will inspire instrumental or dance lessons! Read a book about Irish history. Not modern Pagan practice. History. Learn about ancient history, yes, but also read about modern history. I’m no expert. It’s a work in progress, but we should not embrace Irish lore, symbolism, etc without grasping the fact that the Irish culture is still alive! Learn about what makes them who they are today so that you can inform your practice from a place of integrity and respect. If sitting down to read a book is not your thing, there are many podcasts dedicated to Irish history. Read or listen to Irish lore. Check out Lora O’Brien’s “Learn the Lore” challenge on Irish Pagan School. I can’t say enough about it! I’m so grateful that she is sharing and making so much available to people all over the world. If you want to celebrate your Irish heritage today, please educate yourself. What can you learn about the reality of Ireland today? Instead of spending your cash and time drinking and ‘celebrating’ today, could ya donate that cash to Irish activist causes, and use that time to learn some real history. If you are able, research some of those causes, or others, and donate. I’m currently exploring some of the environmental organizations in Ireland. When I was blessed with the ability to visit in 2011, my favorite memories are of the time I spent along the River Boyne. It was gorgeous, and I long to go back and explore more of the natural wonders in Ireland. Since it inspired and moved me, perhaps that is a cause worthy of donation. What moves you? Cook an authentic Irish dish. I really enjoy exploring recipes from “Irish Traditional Cooking” by Darina Allen. I do have to alter things a bit to make them vegetarian, but I really appreciate all the extra information about the recipes and their cultural context, including how some things used to be made. Even while I don’t use meat, I think it’s important to understand traditional ingredients and why they were used. I made (vegan) white soda bread today using a recipe from the book I linked and a basic, homemade vegan “buttermilk.” I think I used too much flour when I flattened it out… But I made it! I’ll offer some to my ancestors and the Good Folk. Photo by Grey Catsidhe (2019). Study the Irish language! I try to do a lesson each night using Duolingo. Like other Celtic languages, Irish (Gaeilge) needs to be preserved. Studying the language has helped me better understand how to pronounce important names, locations, and concepts within my religious practice, and it’s deepened my connection to my ancestors. Think of every lesson as an offering. Share stories with the young people in your life. Whether it’s fairy lore, mythology, tales of Ireland’s heroes (legendary or historic), or your own ancestral immigration stories, tell them to the children. As I cleaned my ancestral shrine today, I showed my daughter one of the few photos I have of my great, great, great grandmother, Mary, from County Mayo. It’s a treasure, given to me from my grandfather shortly before he passed away. My daughter was very interested, which made me so happy. I hope you take time today to have fun, yes, but also be respectful, learn something, and promote the preservation of actual Irish history, lore, and culture. After many months of admiring from afar, I finally signed up with author Lora O’Brien’s Irish Pagan School. Another polytheist I admire, Morgan Daimler, recommended Lora awhile back, and I’ve been eyeing her website with interest ever since. I’m trying one of the free courses, Learn the Lore, first. They are short, based around 10ish minute readings with videos. Very manageable, especially for someone like me who is trying to revive my academic side of Druidry. I’ve kept my daily devotionals, but I really want to keep learning and reflecting. Hopefully this can yank me from my doldrums. I’m going to try and put my reflections on here as a way to hold myself accountable, and to start blogging more regularly. Yesterday, I read and listened to the first half of Echtra Condla. It’s a story I had read before, in one of the anthologies I possess, but hadn’t really thought much about. First of all, I love listening to Lora read. I am grateful to listen to an Irish person tell the stories, and to hear how the names are pronounced. I was tasked to reflect on my thoughts in regards to the native, Irish lore and the Christian influence on them. Do I read the mythology specifically for the Pagan elements? Do I look for Christian allegory? Does the latter bother me? Etc. I’m comfortable reading lore and knowing that there is a Christian layer. It would be wonderful if we had unadulterated, native Irish mythology, of course, but I’m glad to have what we have. It creates an interesting puzzle. I may not catch all the Christian influence, but I feel that the Pagan elements are so strong that to simply dismiss tales like Echtra Condla would be throwing the baby out with the bathwater. I’m looking forward to day two! It’s interesting to look back to last summer. At this time, we were preparing to make an offer on our home. We were heading into new territory and some of the worst stress I remember experiencing. It was a lesson on patience and austerity, that’s for sure, but it was worth it. Here we are, a year later, transforming our yard into beautiful gardens, shrines, and pollinator habitats. (And a few play areas for the little one!) Last summer was all boxes and uncertainty. This summer, as I stand on my porch to gaze at the small batch of abundance I’ve been cultivating, I feel a sense of peace. I feel that I’m rediscovering my niche after a long period of stress and flailing. My nasturtiums are very happy in their herb spiral garden home. Photo by Grey Catsidhe, 2018. Having the freedom to garden as I desire has been wonderful. Even when I returned home from work riddled with stress and fatigue, a little time in the garden always restored my connection to the Kindred and my own sense of self. Working to form a lasting relationship with this new land has been rejuvenating. It’s reawakened my love of herbalism, and I’m throwing myself back into my casual studies with gusto! Just a couple months ago, it seemed summer was a distant dream. I inherited my late grandfather’s map of Ireland and related books. Photo by Grey Catsidhe, 2018. I’m looking forward to furthering my Druid studies this summer. When I visited my family in the Utica area, these heirlooms from my late grandfather seemed to further point me toward that. He worked tirelessly on my family’s genealogy, something I didn’t appreciate until I was older and started to honor my ancestors. My sister told me she felt my taking these would make him happy, and as I walked around the hallow home where he lived and died, I spoke to him of my intentions, and I got a strong sense of approval. In addition to the map and books, I also picked up some old artwork for my home, and was given permission to transplant some plants in my garden. I brought some of my grandmother’s lily of the valley for the shade garden, and some comfrey for my herb garden. The lilies seem to be taking well. The comfrey looks a tad wilted with the stress of the move. I’ve not lost hope, though. I’ve read they are quite prolific, and even a little section of root can grow. This particular plant is one of the first that my grandmother, an herbal enthusiast herself, taught me about, so if I can establish a patch from her own garden, it would be very meaningful to me. Burning grove offerings in my backyard fire pit. Photo by Grey Catsidhe, 2018. Speaking of Druid studies, my grove is growing strong! My friend and grovie, Cassandra, lead our Summer Solstice ritual. We honored Manannan, and asked him to help us as we reestablished our open doors to communities who need safe places, such as the LGBTQ+ and immigrant communities. It was a moving ceremony, but also one with much joy and laughter. Some of our members identify as part of the former community, including one of our elders who proudly told us about some of the first Gay Pride marches he attended. It was a rainy day, so we held the ritual indoors. I brought many offerings meant for the fire to my home, and I made sure they got to their intended destination last night under the light of a waxing moon. I poured a libation to Brighd to help me with the work – the work of a Senior Druid. Hearing the way Northern Rivers Grove has positively impacted people gives me so much hope. I’m working to improve my practice so that I can serve my community. As I reflect on where I was at this time last year, I feel excited for the relative peace this summer promises. I will continue to work with my new plant allies and the land spirits. I will throw myself further into my Initiate Studies with ADF. Right now, I’m working on Trance 1 and Divination 2, but I know I will have to augment some of the previously completed courses as the whole study program is undergoing change. It’s all good, though. It will all help me become a better Druid and a better person in general! I accomplished quite a bit in the yard today. I came in covered in soil, exhausted, but I feel amazing. There’s still much to be done, but we’re transforming the yard one plant at a time! My husband and I have a vision. It will take years, but it’s part of establishing a relationship with the land, and working with the local spirits to create a magical sanctuary. The pollinator garden is taking shape. The border is temporary (made out of panels from an old planter that bit the dust after moving). Some native plants now have a home here – bee balm, purple and yellow cone flowers, and lavender hyssop. It’s a start! Dad tilled this as well, and we found some really interesting things… Photo by Grey Catsidhe, 2018. We suspect the corner was an old trash heap. Our home was built in the late 1800s, after all. We’ve found various old things in the back – doll arms, parts of tools, broken jars, and these aged gardening shears. Photo by Grey Catsidhe, 2018. In other fun news, I found wild violets and lily of the valley growing in the shaded part of the yard! I’m thrilled as these are plants I’ve wanted to work with for years! Finding these after doing so much work today felt like a positive omen from the local spirits. I took a walk to the cemetery to watch the mist roll over the headstones. I can’t help but imagine spirits migrating over the land when watching it. Earlier, I told another Druid that cemeteries inspire me. They’ve been part of my life since childhood as I grew up with two down my road. One accompanied an old, abandoned church. The other is strictly for departed pets. I liked walking to them and through them. As a teenager, I took my boyfriends to them to kiss in the shadows. The dead didn’t mind, though the pet cemetery has since cut down the bushes that offered some privacy. Now I have a large cemetery behind my home. The dad don’t bother me, though I saw some curious spirits peeking at me when we first moved in. I often go up to say hello. Time takes on a new meaning where the dead repose. Everyday stress melts like ice soaking into Victorian era graves and oaken roots. Life goes on. Enjoy it. Find joy even amidst the decay. Last year, I took a personal day on the Winter Solstice. This year, I used one for Samhain and don’t feel right asking for tomorrow given various things happening at work. I’m mildly resentful tonight as I work myself exhausted trying to make tomorrow a fun and memorable day for my family. I still have things to do for family and friends who celebrate Christmas instead, but I’m ready for our family celebration. I even have dinner ready to cook in the crock when I get up. That way, I can return from work and just relax (while sewing and crocheting some gifts). Working tomorrow means no attempt at a vigil tonight, but we did continue with some new traditions from last year. We made sun and snow sugar cookies. I read Bee a Solstice book before bed, then sang her the Pagan “Silent Night.” We made an offering of a cookie to our Ancestral Morhers, turned off all the lights, and thought about the longest night, darkness, the sun, and rebirth. I’m exhausted, but it’s worth the effort. Enjoy your longest night! Whether you stay up or rise early to greet the reborn sun, may you take a moment to give thanks for the miracle that is the sun and our very existence as we loop around him each year. Three Cranes Grove is doing their annual 12 Days of Solstice-Along starting tomorrow! Like other ADF Druids, I try to follow along in some capacity each year. Now that my daughter is a little older and more aware, I wanted to do something different to make it very kid-friendly and also help us keep track of the days. 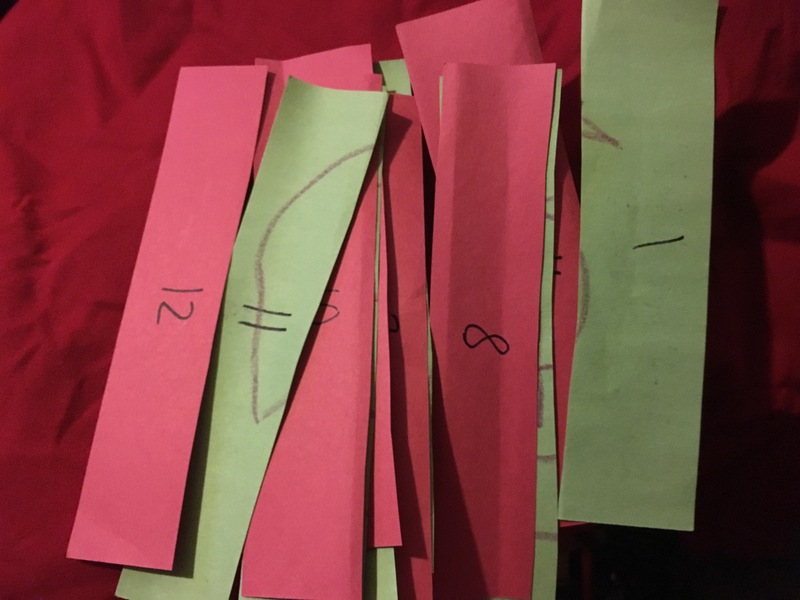 Browsing the internet, I saw that several people make paper chain advent calendars, so I thought – why not!? It’s something the two of us made together using some of her construction paper. 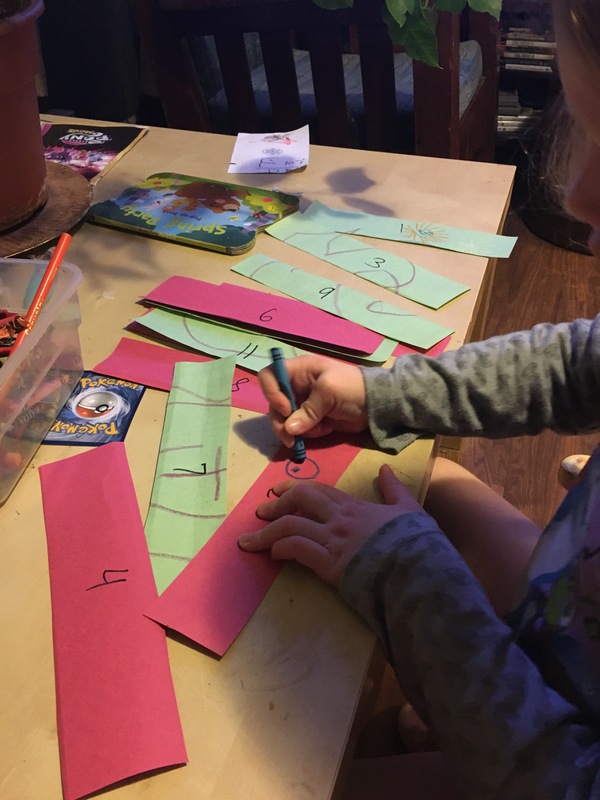 It was also a fun way to review numbers with her. I wrote a number (1-12) on each strip of paper. She added decorations of suns, snowflakes, and happy faces. Inside each loop, there is a very short description for the day’s focus. I basically followed past “Solstice Alongs,” but I changed the 11th night from “Bringing in the Boar” (which I always struggled with) to a night to honor the Ancestors. 12/20 Mother’s night/Solstice vigil – Call my mother, make offerings to ancestral mothers, take a relaxing shower (since I’m a mother), and make a point to discuss darkness when we turn off all the lights before bed. Vigil? On a work night? Haa…. I wish. Maybe we’ll make some paper suns tonight. 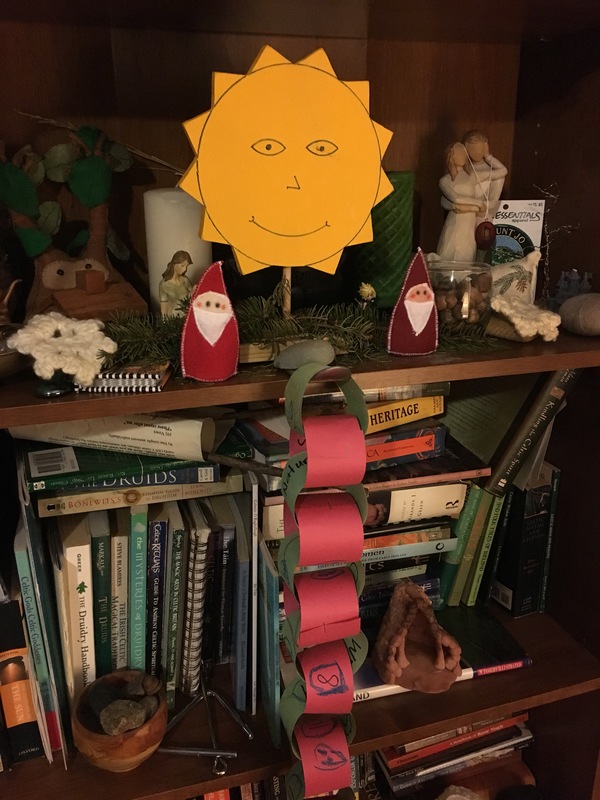 12/21 Solstice Day – I will rise and get ready for work, but take some time to greet the sun with prayers and offerings. We’ll later have my family gathering with feasting. I told my daughter we will celebrate the sun’s birthday today. We will exchange gifts. 12/22 Nature Spirits – We’ll take a walk outside and give offerings to the spirits. Perhaps we will wassail the trees? 12/24 House spirits – We’ll make offerings to the house spirit (first time here!) and tidy up a bit. We’ll also give an offering to the spirit of generosity in the form of Santa Clause. 12/25 Sun Child – I read that the original creator of the Solstice Along tweaked this day to honor the sun child. We will make offerings to Angus this day and visit family for their other celebrations. 12/26 Celebrations of winter/snow – We’ll plan to take another walk outside and make offerings to An Cailleach. 12/27 Celebration of the evergreen – We’ll make special offerings to the trees. If we didn’t wassail earlier, we’ll do it today for sure! 12/28 God/desses of the household (Brighid) – We’ll honor Brighid and thank her for keeping our home warm. 12/29 Shining ones – We’ll honor the gods and goddesses our tribe honors at the main altar. 12/30 Honor Ancestors – This was the “bringing in the boar” day, but I’ve decided to make this an occasion to honor all my ancestors. 12/31 Twelfth Night — Resolutions, divination, remembrances, and saining the home. I hope that making the chain will help my daughter feel more involved. I’ll share some reflections later! Best of luck as you prepare for your own celebrations.